Typing on a tablet is serviceable but not without strange moments. It's pretty clear that typing is a secondary function for the iPad. We knew this would get a little bit weird. Apparently, there's no better way, than to hook up an external keyboard. More on that later. First, the on screen stuff. The iPad's keyboard is big. In landscape mode, it takes up half the screen and each letter is about as full sized as physical keyboard. It goes a long ways towards accuracy, but scanning your fingers across the large layout takes longer than it would on, say, a phone. The difference in size changes things in a meaningful way: You can touch type on it in this mode. But there's a bit of a compromise going on, which is going to be inherent to all touchscreen keyboards on tablets. Your wrists, fingers, the screen and the keyboard are all at odds with each other. If the screen's viewing angle is straight to your face, your wrists are breaking at an awkward angle to type on the screen. If you flatten the surface like a keyboard, the screen—already reduced in practical display real estate—starts to be obscured by your hands. Pushing the device away and at a slight angle—perhaps by using the wedge shaped case that Apple sells, is the best course of action. But if the best way to type on the touchscreen requires a sort of kickstand, maybe the iPad should have had a kickstand? I'll leave that to the industrial design test note section. You make some errors, but man oh man can you type fast! As fast as you can on a touch keyboard, with some errors that are caught by the auto correcting algorithms and some that require you to type the word over again. Oh you have to make sure your finger nails are really short when touch typing on a touchscreen. Otherwise you get a tic instead of a tap, and nothing instead of a keystroke. In portrait mode the keyboard is too small to touch type on—you can do it but errors go up and speed goes down. But you can hit it up with two modes that are successful on the iPhone—the two handed grip using thumbs to peck, and the one hand to grip with the other hand touch typing. The hard thing about typing with all 5 fingers on one hand and a thumb on the gripping hand is that the iPad weighs too much for the afforded grip and leverage to keep this up for very long. The best thing about typing in portrait is that you can see so much of the screen above the keyboard, unlike in landscape mode. One handed input, while fast on an iPhone, is too slow. It's because the keys are just too far apart. No design decisions are perfect and what you have are trade offs. Apple knows this. While the iPad's meant for media consumption and touch-pointing input first, it's still powerful enough to do real work on, on a real screen. Device for typing on really. Which is why they have the external keyboard support, by the integrated dock or the bluetooth keyboard, which Apple has offered for years for their computers. Frankly, the dock is superb, but the folding case will provide the same propping up you'd want while using an external keyboard. Frankly, the dock that incorporates the keyboard seems like a bad idea; a single serving accessory if you will. Go for the case and wireless keyboard (or any bluetooth keyboard) because they'll stow nicely and provide extra functionality. 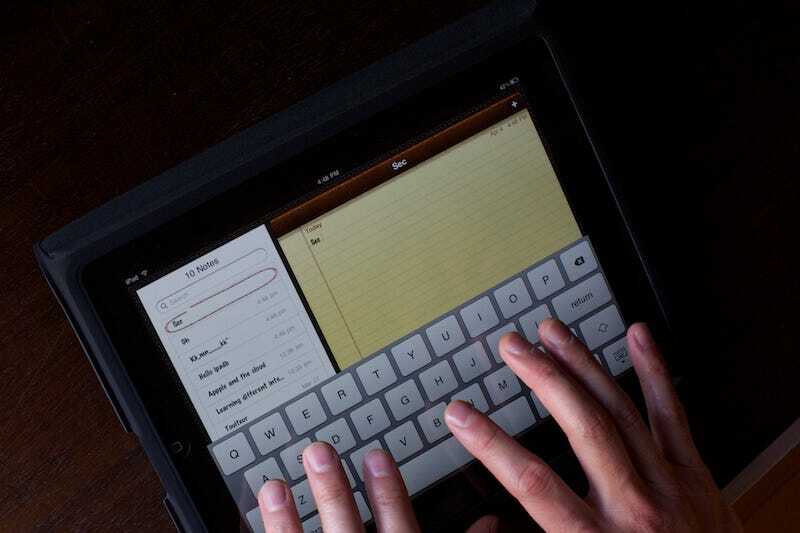 Once you've paired the iPad and keyboard up, the keyboard can wake the iPad from sleep. The volume, brightness and media control buttons work for the iPod player. (Even when running in the background.) The eject key brings up the onscreen keyboard and tucks it away, but alas, the escape key does not function as the home button. Tab works to jump between fields but the arrow keys do not let you select, say, contextual pop up menu items like autocompleted names in the "To:" field in an email. They should fix that, because it is quite jarring to touch a screen above a keyboard. Prediction: Plenty of people will be tapping their screens on macbooks, once they get used to working on an iPad with an outside keyboard.